Basketball tipster Will Burns previews tonight’s games that hopefully help us wake up rich on Monday morning. After the injury to everyone’s favourite snake Kevin Durant in Washington last Tuesday, the Golden State Warriors (W50-L11) have hit a blip losing the last two away against the Wizards (112-108) and in Chicago against the Bulls (94-87) where Steve Kerr’s men shot a season-low 38.6%, their worst offensive output since March 19th last year. However, the Warriors are still averaging 117.5 points per game (a league-high) with 49.6% shooting along with 30.8 assists so they are well equipped to stop the rot and from slipping to the third loss in a row. Although the impressive stats, the problem with the Warriors has not been hard to identify – three-point shooting. Stephen Curry has been woeful, just hitting four of 31 (12.9%) from beyond the arc in the first three games of this current five-game road trip, while team-mate Klay Thompson not impressively gone slightly better, hitting seven for 33 at just 21.2% success. 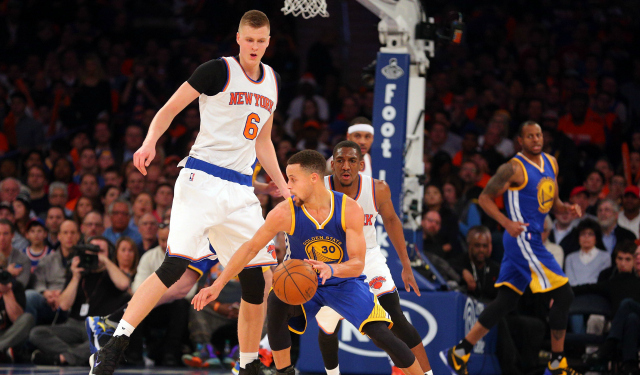 The New York Knicks (W25-L37) could also use a win after losing eight of their last 11 games. The Knicks are averaging 105.7 points with 44.7% shooting and conceding 108.7 points per game. Tonight’s game comes from the historic Madison Square Garden where the Knicks have lost five of their last seven there. On Friday, the Knicks lost 105-102 in Philadelphia which dropped the New Yorkers to 12th in the Eastern Conference, trailing the Detroit Pistons by five games for the eighth and final spot, and deeply entrenched in the middle of the lottery standings currently. GSW’s NBA record of 146 straight regular season games without back-to-back losses has now been diminished, so it’s time for Steve Kerr’s men focus on avoiding the team’s first three-game losing streak since November of 2013. The Knicks should play the perfect foil, as the Warriors have won the last five meetings between the two teams, all by at least 13 points. Watch for Curry and Thompson to get that act and their shooting back together. Give me Warriors on the handicap of 9.5 at 1.83 for out first selection. The ‘Triple-Double Machine’ Russell Westbrook and the Oklahoma City Thunder (35-27) roll into Dallas, Texas early Monday morning and no-one has carried a team better than Westbrook this season. Valued at 6/4 for the season MVP, and rightly so, Westbrook has claimed THIRTY triple-doubles already this season. He came one assist shy of his 31st on Friday in Phoenix with 48 points, 17 rebounds and nine assists. In addition, he has scored at least 40 points in four consecutive games, a streak only achieved by nine players ever and last done by Lakers legend Kobe Bryant back in 2012. Westbrook triple-doubles have been a sign of success, with Oklahoma City going 24-6 this season when he notches one. However, despite Westbrook’s amazing achievements, on the road the Thunder are just 12-19, having lost their last six away, although they do hold a five-game winning streak over tonight’s opponents, but that was before Nerlens Noel joined the Mavs. The 6ft 11 Noel, a trade deadline day acquisition from the 76ers, has certainly given the Dallas Mavericks (25-36) a lift, scoring 36 points, collected 35 rebounds and blocked five shots in his four games. He also is 15-of-26 from the field and in Friday’s 104-100 win over the Memphis Grizzlies, Noel scored 15 points, blocked two and snatched a career-high tying 17 rebounds. The impact in the line-up has been visible with the Mavs 3-1 since Noel suited up, however can they stop Westbrook? Well, in a nutshell, I cannot pick a confident winner. This season, OKC have been averaging 106.4 points per game and 102.5 PPG on the road. While Dallas are the worst scorers in the league at just 97.8 PPG and 100.1 at home, the third worst in the league. For this fact I feel a look at the total points markets as my most confident bet and Under 209 pts is valued at 1.76 and that is my selection. If you wish to combine the pair for a double this will pay £31.00 off a tenna with Bet365. Remember to like us on Facebook and follow us on Twitter to join in on the #NBAChallenge posted daily on both accounts where we try to go from £10 up to £100.